The project deals with the study of architectural concept, the construction and implementation of an automatic plant for the processing and modeling of composite materials for the production of models for molds for different industrial sectors: marine, aeronautical, railway and automotive. The system in particular has been equipped with functionalities that perfectly meet the dictates of Industry 4.0 and related enabling technologies. 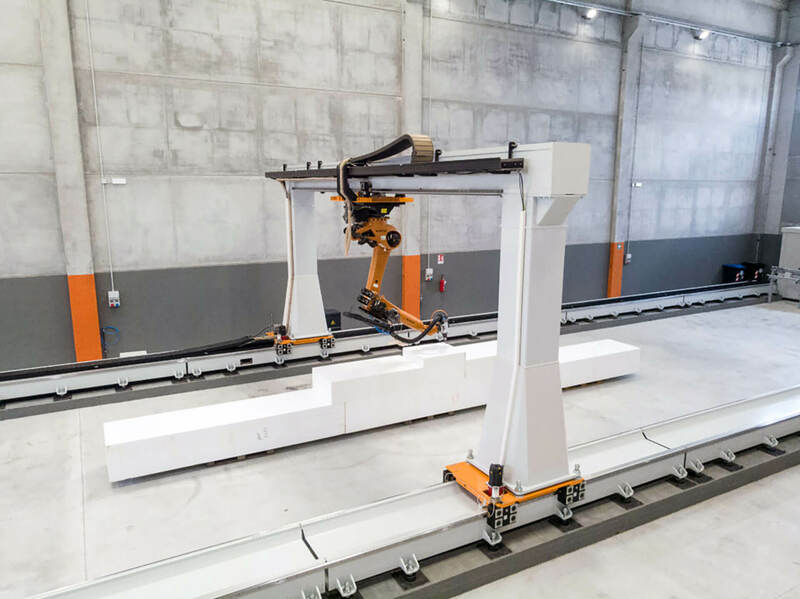 The system in particular operates the automatic milling and sanding of large surfaces thanks to the use of robots equipped with anthropomorphic arms with ample operating space and is equipped with a management system that realizes the complete automation of the entire machining procedure thanks to the availability of various tools and heads and a fully monitored warehouse. In addition, the control and supervision software were designed to ensure the correct management of the robot’s implementation system, to manage the execution of the machining functions with an automatic management of the heads and tools present in the warehouse, network monitoring of productivity, in terms of working hours, and the display and processing of control charts of suitable variables identified as strategic process quality (CTQ). The continuous and automatic monitoring of these control charts, together with appropriate data mining strategies, allows the system to be equipped with additional functions such as predictive maintenance. Pure Power Control is a well-established company that develops electronic controls and innovative solutions in automotive and working machines, construction machinery and agriculture sectors, applying the most advanced results of technological research and using state-of-the-art methodologies and tools.